To be unforgiving is harmful. The inability to come to terms with one’s anger or strife often can lead to stress disorders, mental health disorders, and relationship problems. Forgiveness is a personal decision. Forgiveness and Reconciliation focuses on individual experiences with forgiveness, aiming to create a theory of what forgiveness is and connect it to a clinical theory of how to promote forgiveness. Dr. Worthington creates an evidence-based approach that is applicable for individuals and relationships, and even for society. He also describes an evidence-based method of reconciliation - restoring trust in damaged relationships. Dr. Worthington hopes that this theory will inform scientific research and improve intervention strategies. Showing that forgiveness transforms personality, Worthington describes ways a clinician can promote (but not force) forgiveness of others and self. He provides research-based theory and applications and discusses the role of emotion and specific personality traits as related to forgiveness. 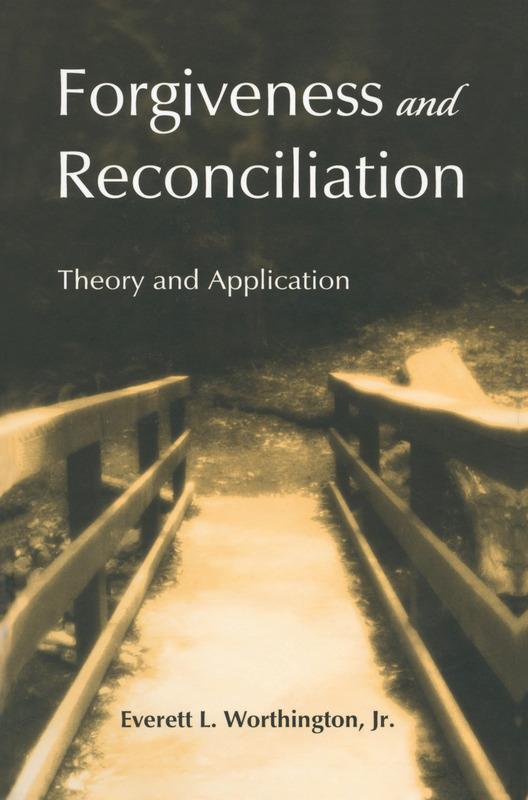 Forgiveness and reconciliation might not be cures, but, as Worthington shows, they are tools for transforming both the self and the world. Preface. Acknowledgments. Introduction. Part I: A Stress-and-Coping Theory of Forgiveness and Relevant Evidence. Models of Forgiveness. A Biopsychosocial Stress-and-Coping Theory of Forgiveness. Evidence That Unforgiveness is a Stress Reaction. Emotion in the Stress-and-Coping Theory of Forgiveness. Evidence Supporting the Emotional Replacement Hypothesis. Part II: Personality Traits of Forgivers and Nonforgivers. Forgiveness and the Big Five Personality Traits. Dispositions Related to Unforgiveness and Forgiveness. Personality can be Changed. Part III: Clinical Applications to Promote Forgiveness and Reconciliation. A General Approach to Psychotherapy. Intervening Specifically to Promote Forgiveness. Intervening to Promote Forgiveness of Self. Intervening to Promote Reconciliation. Research Support for Helping People REACH Forgiveness. Promoting Forgiveness and Reconciliation Within Society. Conclusion: Forgiveness is not a Panacea. Appendix: What is Forgiveness? References. Index. Everett L. Worthington, Jr., Ph.D., is Professor of the Department of Psychology at Virginia Commonwealth University. Dr. Worthington was founding editor of Marriage and Family: A Christian Journal, and serves on other editorial boards of professional journals. He was founding Executive Director and Treasurer of A Campaign for Forgiveness Research, a not-for-profit organization devoted to supporting research into forgiveness (www.forgiving.org), which led to being editor of Handbook of Forgiveness (Brunner-Routledge, 2005). He is a leader in the field of forgiveness research, teaching, publishing, and dissemination.